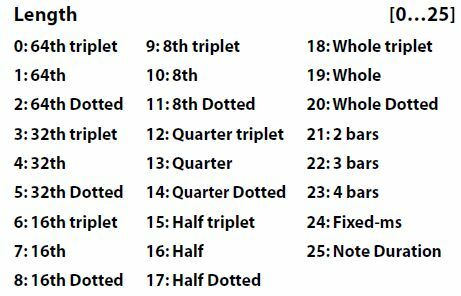 Stephen: This image (and the vid tutorial links afterwards) would be better in the GE RTP include table below, but I cannot edit any includes. 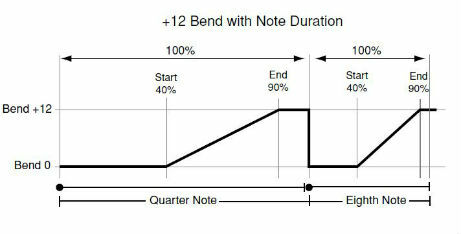 Slider 7 Bend Start % Specifies when the pitch bend will start in the overall bend window, based on the Bend: Length parameter or note duration. A setting of 0% means the pitch bend will start immediately. Increasing this value will delay the start of the pitch bend accordingly, e.g. 50% means that the note will initially play and hold its starting pitch for half of its duration before the pitch bend occurs. Switch 5 Bend On/Off Turns ON or OFF pitch-bending effects, which are further programmed or controlled by these GE RTP (see below): Bend: Start % (on Slider 7), Bend: Length (on Slider 6), Bend: Amount (on Switch 6), and Bend: Alternation (on Switch 7). Switch 6 Bend Direction Controls the direction of the pitch-bend effect as programmed by the Bend: Amount GE RTP. In respect of this RTC Model, it is most commonly programmed to bend down or up -12 / +12 semitones. Note: the actual resulting size of the bend also depends on the setting of the Bend Range parameter, which sets the overall pitch-bend range for the GE. Furthermore, adjustments may be required to the timbre's pitch-bend settings in order for the bending effects to work properly.